Pen & Sword Military has a well-deserved reputation for the quality of their military history books. It was only natural that they would develop a list of DVD titles alongside the book publishing. This DVD matches the quality achieved by Pen & Sword books. The group of historians and battlefield guides responsible for writing, directing and presenting this history in the Waterloo Collection of DVDs has produced a lively and colourful account of a key part of the Battle of Waterloo when Napoleon made one last throw of the dice and was driven from the field in defeat. . The shooting of the film on the battlefield and the involvement of the Napoleonic Societies re-enactment enthusiasts really brings the battle to life, with the discussions between presenters fitting naturally into the presentation with a refreshing informality that draws the viewer into the discussion. An excellent DVD at a very affordable price and a worthy companion to the books that detail the Napoleonic Wars. DESCRIPTION: Pen & Sword Military has a well-deserved reputation for the quality of their military history books. It was only natural that they would develop a list of DVD titles alongside the book publishing. This DVD matches the quality achieved by Pen & Sword books. The group of historians and battlefield guides responsible for writing, directing and presenting this history in the Waterloo Collection of DVDs has produced a lively and colourful account of a key part of the Battle of Waterloo when Napoleon made one last throw of the dice and was driven from the field in defeat. By using a mixture of footage from battle re-enactment with discussions between presenters at locations around the battlefield, there is full use of colour video with a reliable soundtrack. If all the DVDs in the Waterloo Collection come up to this standard, they will form a very valuable source of information on a battle that changed the course of European history and allowed the British dash to Empire that directly affected more than 50% of the world and indirectly affected virtually all of the remainder. By breaking the Battle of Waterloo into sections addressed by separate DVDs, each key element receives adequate coverage. The Farm of Hougoumont formed perhaps the most important element in Wellignton’s battle line. It formed a breakwater against which French troops were dashed and it prevented the French from turning the Allied line. It was fiercely fought over and much of the original walls and buildings have survived to this time, although now requiring a major restoration and a long-term maintenance program. The DVD has taken the opportunity to include an appeal for funds to support this essential work and presents one of the challenges faced by British interests. Most important battles for Britain have been fought on foreign soil and in conjunction with allies. The battle sites are non-the-less of great importance to British history and of great interest to generations of Britons. Unlike battle sites in Britain, the traditional sources of preservation and conservation funds are not available to support battle sites outside the British Isles. At the same time, the sites may hold little interest in the host nation because they record a defeat of its earlier generations. 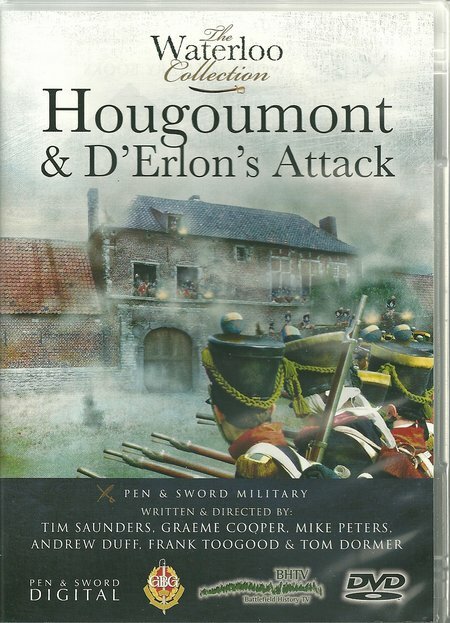 This DVD may therefore achieve two important objectives, presenting the history of the battle in an engaging and informative way, and making viewers aware of the need to develop a fund to undertake the restoration and maintenance of Hougoumont for future generations. As the DVD so graphically recounts, Napoleon was marching on Brussels in a final throw of the dice to re-establish his Empire. He was already ill and probably in the early stages of stomach cancer. His best Marshals were also aging and some may have held less enthusiasm for the campaign. To have returned to France from exile and built up a new army was a major achievement in its own right, but it was to prove insufficient. Wellington was nominally in a stronger position, although many of his key people were matching the age of the French commanders. The allied forces were not well co-ordinated and had begun to descend into the inactivity of peace where officers spent more time in the saloons and dances than in drilling their troops. The army was some way from the battle-hardened troops with which Wellington had stormed into France from Iberia. There will always be debate between historians as to why one failed and another succeeded in this campaign, whether the winner or the loser was determined by luck, how technology played out and where allies failed to work together as closely as they should have. There are even French historians who claim Napoleon really won or deserved to win in the same way as some Germans believe they won two world wars only to be robbed of victory. For the nations on the winning side at Waterloo there is a failure to fully recognize the achievements of particular allies. In the end, the winner is the force that stands on the field after their opponents have fled. In all battles there are variables that are beyond the direct control of commanders. In the case of this historic engagement, Wellington for the first time confronted Napoleon on the battlefield and was disappointed in his adversary. The French depended on artillery, which was the military discipline in which Napoleon started his military career, and on bouncing their shot into the enemy positions. In the wet and boggy conditions shells failed to bounce and did little damage. The battlefield itself was probably not to the taste of either commander but it was a natural point at which to defend Brussels and was almost exactly the site of Marlborough’s decisive engagement a century before. Napoleon lost an important section of his force because they marched away to catch Prussian forces, and the Prussians arrived at the battle at a very favourable time. A small change in any of these factors could have changed the fortunes of battle but as in the Battle of Britain more than a century later, the RAF held the field of battle and the German aviators retreated. The fact that a small change, here or there, might have changed the outcome for Britain and Europe is irrelevant as is true for any battle in history. The victors triumph because they resisted and seized the opportunities more effectively than the enemy. In the case of Hougoumont, the walls and buildings made the site easier to defend than to attack, but the British held out against sustained assault because they had the will to win. In the process they protected the rest of the British line and gave Wellington greater choice in the execution of the battle. The shooting of the film on the battlefield and the involvement of the Napoleonic Societies re-enactment enthusiasts really brings the battle to life, with the discussions between presenters fitting naturally into the presentation with a refreshing informality that draws the viewer into the discussion. An excellent DVD at a very affordable price and a worthy companion to the books that detail the Napoleonic Wars.